NUMBER 1 SUNDAY TIMES BESTSELLERNo one is born a leader. 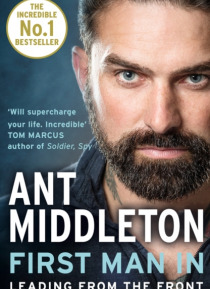 But through sheer determination and by confronting life's challenges, Ant Middleton has come to know the meaning of true leadership. In First Man In, he shares the core lessons he's learned over the course of his fascinating, exhilarating life.Special forces training is no walk in the park. The rules are strict and they make sure you learn t… he hard way, pushing you beyond the limits of what is physically possible. There is no mercy. Even when you are bleeding and broken, to admit defeat is failure.To survive the gruelling selection process to become a member of the elite you need toughness, aggression, meticulous attention to detail and unrelenting self-discipline, all traits that make for the best leaders.After 13 years service in the military, with 4 years as a Special Boat Service (SBS) sniper, Ant Middleton is the epitome of what it takes to excel. He served in the SBS, the naval wing of the special forces, the Royal Marines and 9 Parachute Squadron Royal, achieving what is known as the 'Holy Trinity' of the UK's Elite Forces. As a point man in the SBS, Ant was always the first man through the door, the first man into the dark, and the first man in harm's way.In this fascinating, exhilarating and revealing book, Ant speaks about the highs and gut-wrenching lows of his life - from the thrill of passing Special Forces Selection to dealing with the early death of his father and ending up in prison on leaving the military - and draws valuable lessons that we can all use in our daily lives.